If you are an aspiring pharmacy technician, then be aware that you can achieve your goals by taking part in the pharmacy technician certification course which is now available at Brainmeasures. The pharmacy technician course offered by Brainmeasures is highly beneficial considering the fact that it allows you to gather all the information that you need to become in the top positions of the pharmaceutical industry. With the help of this online certification course, you get the chance to undergo a kind of pharmacy technician training which explains in full detail the major concepts associated to being a pharmacy technician, the major roles and responsibilities that you need to handle, the skills and knowledge needed to become an expert pharmacy technician and the many things that you can do to offer the safest and the most accurate drug information to different types of patients. 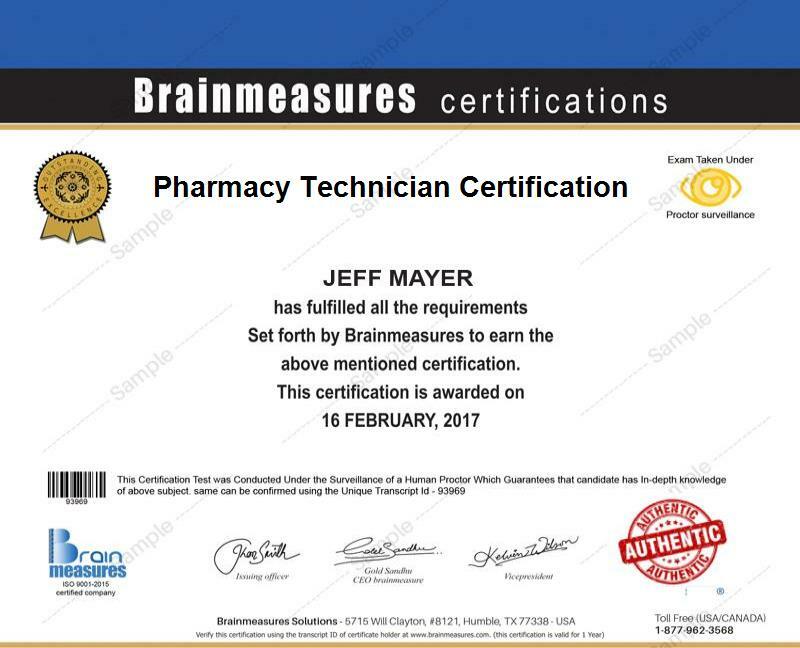 Receiving your pharmacy technician certificate from Brainmeasures is proven to be really rewarding considering the fact that it certifies your competitive skills and knowledge in the field. How to effectively handle medications? How to prepare and deliver drug products? How to maintain the excellent condition of the drug products in your pharmacy? The pharmacy technician certification program which is now available at Brainmeasures targets all aspiring and existing pharmacy technicians who wish to gather more information about how they can achieve success in the field. It is suitable for you if you have longed to become a pharmacy technician and you wish to understand the major duties and responsibilities that you need to handle once you enter the pharmaceutical industry. As a pharmacy technician certification holder, you can also expect to earn higher. Your pharmacy technician certification is effective in showing the industry that you have competitive skills and a broader knowledge about offering quality pharmaceutical services to the public so there is a great tendency that you will receive a higher salary. At present, certified pharmacy technicians can expect to receive at least $54,000 per year. You can expect this to grow even more if you work in a well-funded and huge hospital.